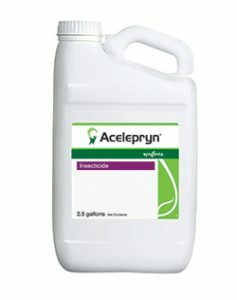 One application of Acelepryn® insecticide (April – mid-June) provides season-long control of white grubs, billbugs and surface-feeders like turf caterpillars. With its active ingredient, chlorantraniliprole, Acelepryn can also be applied to trees, shrubs and ornamentals to help control landscape pests like Japanese beetles, webworms, lace bugs and aphids. Its environmental profile has little-to-no impact on beneficial insects and non-targeted insects, like bumble bees, making it a good fit for use on turf where beneficial organism preservation is a concern. For more information, visit GreenCastOnline.com/Acelepryn or download a free homeowner brochure about Acelepryn at SyngentaTurfTools.com. ©2017 Syngenta. Important: Always read and follow label instructions. Some products may not be registered for sale or use in all states or counties and/or may have state-specific use requirements. Please check with your local extension service to ensure registration and proper use. Acelepryn is not for sale, sale into, distribution and/or use in Nassau, Suffolk, Kings, Queens Counties of New York State. Acelepryn®, GreenCast® and the Syngenta logo are trademarks of a Syngenta Group Company.